128 pages, 16 patterns, color throughout. These ain't your grandmother's Log Cabins. (Well, one is, but the other 15 quilts are beyond anything she ever could have imagined!) No one knows more about Log Cabins than Judy Martin does, and she shares a lifetime of experience in this exciting, new book. For as long as people have been making quilts, they've been making Log Cabins. And for as long as Judy Martin has been designing quilts, she's been designing Log Cabins. Her first book was Log Cabin Quilts, back in 1980. She's been tinkering with Log Cabin designs ever since, creating such popular patterns as Colorado Log Cabin, Starlight Log Cabin, and Spring Valley Log Cabin. Now she's back with a new set of Log Cabin patterns ready to take their place beside her earlier classics. Which quilt is your favorite? 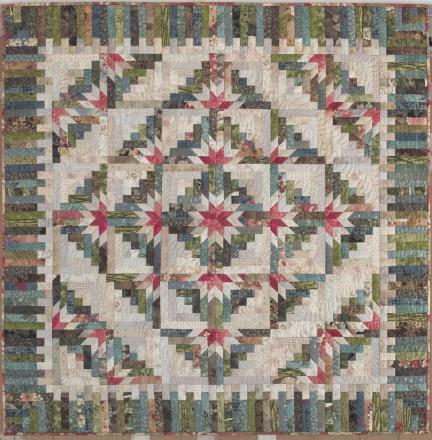 We conducted a series of weekly polls to determine which quilt in Judy Martin's Log Cabin Quilt Book was the public's favorite. Take a look and see which quilt won and how your personal favorite fared. A Log Cabin house in a Log Cabin quilt! Mt. Shasta Star: a beautiful quilt made from nothing but logs! 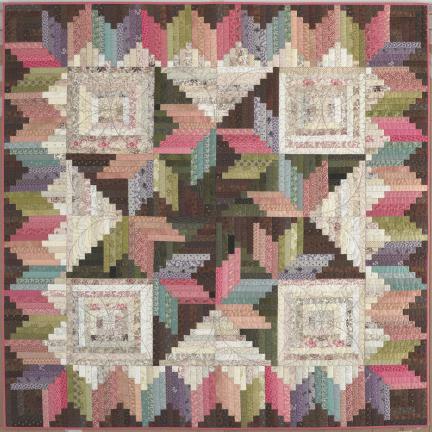 Judy Martin calls the Log Cabin, "the perfect pattern." It has basic shapes, simple contrasts, and minimal joints, making it ideal for beginners. The Log Cabin also provides instant feedback on your cutting and sewing, allowing you to correct tiny errors before they become big headaches, and in the process improve your quiltmaking skills. And quilters of all experience and skill levels love the Log Cabin because of its limitless potential for varying the arrangements. If you love playing with arrangements, Judy shows you more than 100 setting possibilities for Log Cabins! And the glowing reviews are starting to come in! I love Judy Martin’s Log Cabin Quilt Book. I love the quilts and the pieced borders. As usual, your instructions are precise, complete and easy to follow. My book arrived yesterday, and it is just beautiful. I can't tell you how much I enjoy your patterns with their very clear directions and the beautiful colorful fabrics in each quilt. I just received Judy Martin’s Log Cabin Quilt Book. Wow! It’s absolutely inspiring! Two of my favorites are on the cover, but there are so many more that are spectacular inside. Thank you for the setting plans, too. Congratulations on another fabulous book. The quilts in your new book look even more exciting than I've come to anticipate from you! Your extraordinary sense of color and style makes it fun to look at the book and dream of what I want to make next. Moreover, your reputation for providing accurate, thorough instructions makes the sewing as much fun and stress-free as the dreaming. Thanks for giving the quilt world such great new variations of the Log Cabin pattern. You've outdone yourself once again! 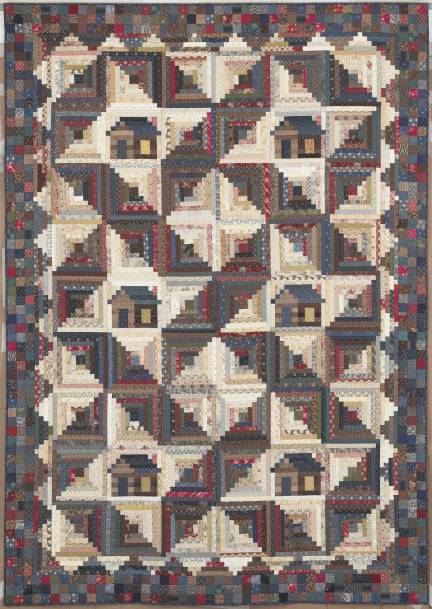 Judy Martin’s Log Cabin Quilt Book offers endless creative possibilities for this traditional block. While I enjoy using simple sets for my Log Cabin quilts, I am excited to mix and match Judy’s design elements to create a design of my own. This well-organized book allows me to put my own touches on the finished design. This may be your best effort yet! What a lovely book this is! The extraordinary Finger Lakes Log Cabin. Do you want to make quilts that speak to you forever with their beauty? Do you want to make quilts that will make your family proud that you are a quiltmaker? Do you want to make quilts that affirm you as a quiltmaker? Do you want a quilt book that respects your intelligence and salutes your individuality? 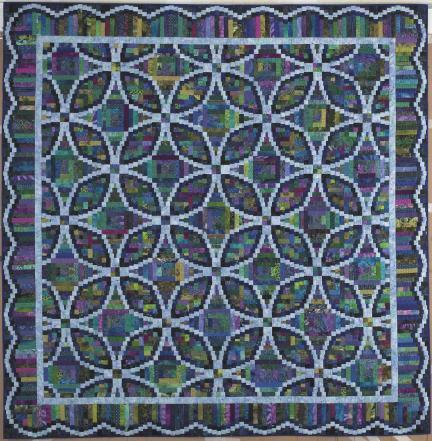 Do you want to make quilts that extend the grand tradition of your quilting forebears? Do you want to recapture the spark that made you want to make quilts in the first place? Of course you do! Then you need to demand more from your next quilt book. Judy Martin has built a career on consistently giving you more for your money, and Judy Martin's Log Cabin Quilt Book is no exception: more brand-new patterns, more ideas, more sizes, more helpful tips, more information packed into 128 pages than you could ever imagine. In short, it has more of everything you want and need in a quilt book. Judy first popularized the Star in the corner of the Log Cabin block in Colorado Log Cabin. She gives the idea a more stunning treatment in Timberline Log Cabin. Judy Martin's Log Cabin Quilt Book would be a great book even if it had nothing other than its 16 beautiful quilt patterns. But there's more, so much more. An entire chapter is devoted to borders, complete with 17 sumptuous photographed examples and 16 illustrations of borders you can add to your Log Cabin quilt. Another heavily illustrated chapter discusses the many possibilities for settings. Judy shows numerous photographic examples and then goes on to provide 66 illustrations of sets you can use for almost any Log Cabin. A chapter is given over to how to quilt Log Cabins, complete with mouth-watering closeup photographs. 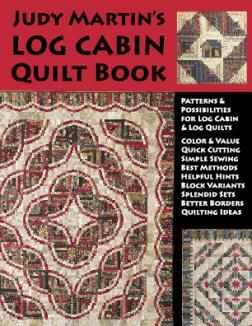 Judy provides inspiration and information for quilting your Log Cabin your way. You'll find a conversion chart that enables you to change the width of the logs you use. If Judy used a 1" finished log and you want to make the quilt with a 1-1/2" log, you can do it as easily as you can turn a page. Other important sections discuss the importance of light and dark values in your fabric selection for a Log Cabin; how to achieve a perfect seam allowance; how to press seams; why cutting lengthwise strips is so important for Log Cabins; how to cut lengthwise strips; how to keep track of logs of varying lengths; and much, much more. See for yourself why quilters who want to get serious about making beautiful quilts turn to Judy Martin again and again. 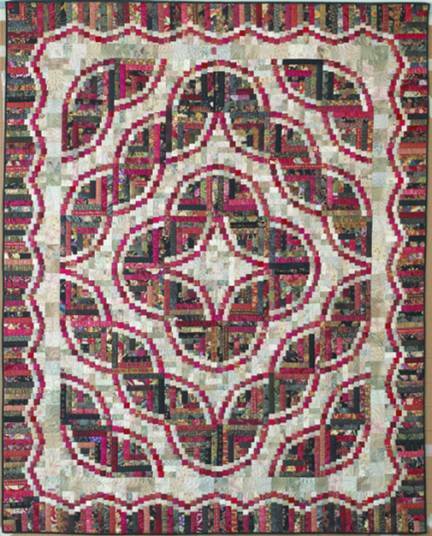 Judy Martin’s Log Cabin Quilt Book will inspire you to make great quilts! Would you like to make Snake River Log Cabin in king size? Click here for the yardage and cutting requirements and here for the quilt diagram. Both pages are in pdf format. Because of the popularity of this quilt, we've also added pdfs of the queen size quilt diagram and the wall size quilt diagram.